It’s hard to overstate how bad the Saints defense was Sunday. Fitzpatrick torched the group for 417 yards and four touchdowns, finishing with a 156.2 passer rating. Fitzpatrick also ran nine times for 36 yards and scored, and his 12-yard run late in the fourth quarter converted a third down and effectively ended the game. The pass rush was pretty much non-existent for the Saints. The secondary allowed too many long completions. The linebackers let too many run plays reach the secondary. Sunday’s game was reminiscent of the season opener in Minnesota last year as the Saints defense allowed big play after big play. With a performance as bad as Sunday’s, the Saints coaches and players deserve equal blame. The defense looked totally unprepared, and the players made repeated physical and mental errors. Even cornerback Marshon Lattimore, the reigning Defensive Rookie of the Year, had a rough day. 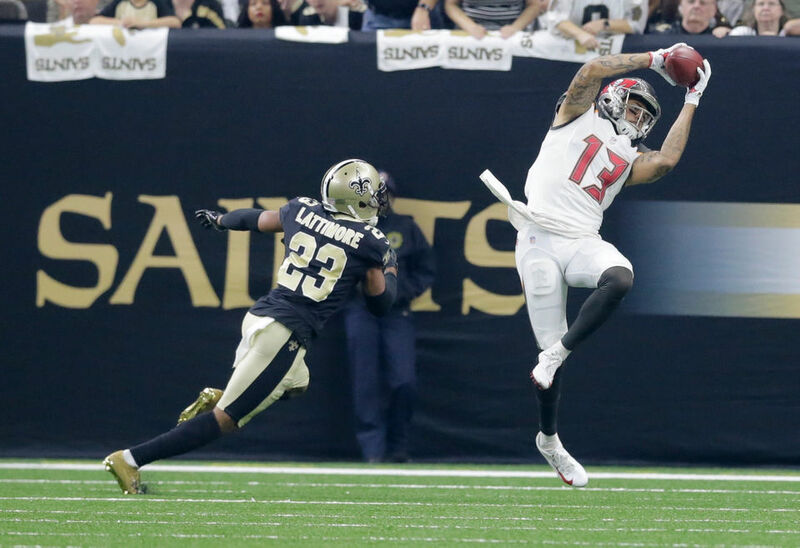 As Mike Evans created long plays, Lattimore looked worse Sunday than in any game last year. On the other side, DeSean Jackson burned Saints cornerback Ken Crawley multiple times, too. Brees is still the man. But Leon, can't do it all. The D let the rest of the team down. Need more contribution from the TEs and WRs (other than MT)... and other RBs. Thank you, Mark Ingram. Peat not playing affected us. AWOL were the DLine, LBers, and DBs. Never seen Lattimore look this bad. Hopefully not a sophomore jinx hangover. Move on and forget this game. Hopefully we can regroup like we did last year. Last edited by SmashMouth; 09-09-2018 at 03:44 PM..
Brown's gonna smoke us in our own home. I’m so sorry Drew. 439 yards, 3 TD’s, 0 INT’s... And a loss. It’s this crap right here that causes Brees to not get the respect he deserves. First game of the season, at home, against a team everyone expected to fire their head coach by the halfway point of the season and we utterly embarrass ourselves. 5 years of losing the opener. Will the Bucs cut Jameis Winston... and go shopping for crab legs right now? Bahahahaha! You're such a downer Diz. Lmao! Marcus Williams looks scared to tackle, seriously that long screen pass that got called back, he just ran alongside their receiver for 30 yards. Thomas was great, but still needs to hold the ball properly, the fumble was a killer. Kamara is our offense now. Marcus Davenport had a great hit and got flagged for it, I'm utterly confused. We don't have a a first round pick next year and SP mortgaged our draft on this year's success. Crawley and Lattimore were awful, Lattimore looked slow and Crawley couldn't turn his head. jnormand, Rsanders24, SmashMouth and 1 others like this. Is Dennis Allen and upgrade over Rex Ryan?